What are the recent improvements in existing Maintenance Billing system? Maintenance Billing System is made computerized using a central Database of Owners’ information. Penalty for Late Payment & Discount calculation can’t be manipulated by FM or any unauthorized person. Time and Errors for Manual calculation is reduced a lot. There are regular email alerts for maintenance bills, outstanding, account status, etc. Paper usage and man-hours to generate and circulate the bills has been reduced by 90%. Why or when am I a Maintenance Payment Defaulter? Or your Total Outstanding is more than the allowed credit limit already. Previously it was equal to your Monthly Billing Amount, but w.e.f. Jan ‘2016 it is Rs. 0 (zero). 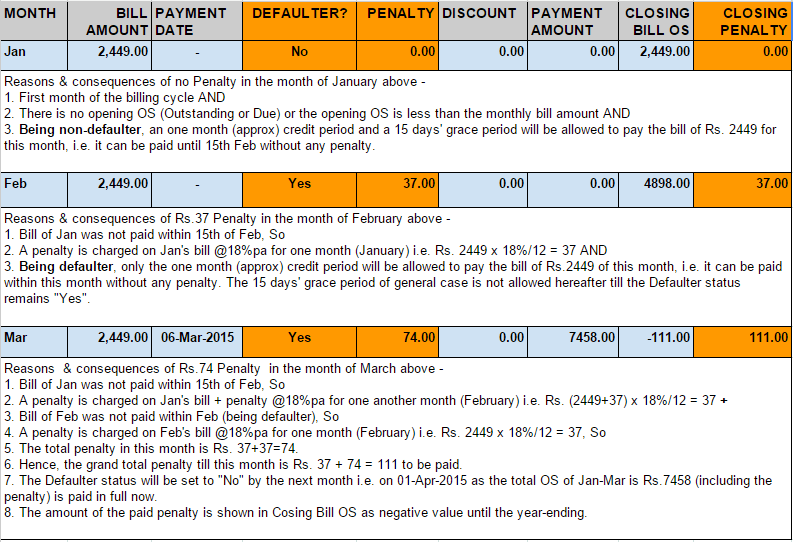 What are the consequences of being defaulter in Maintenance billing system? A Penalty is charged on Total Outstanding (Due) [Bill Outstanding + Previous Penalty + Other Charges if any] @18%PA, calculated monthly basis for late payment. Payment grace period (15 days) is not applicable. Any regular Discount (ref. Maintenance Bills) is also not applicable. Defaulter status is calculated and set on day 1 & 15 of the month, and once it is “Yes” then it will be fixed for that whole month. How much time do I get to pay a maintenance bill once it is generated/calculated? In Maintenance billing system – bills are generated quarterly for the monthly ad-hoc maintenance payments. The bill is generated/calculated on/from 1st day of the month. Once the bill is generated/calculated, a 15 days’ grace period is allowed for the owners (except defaulters) to pay it. Hence, the flat owners need to pay the maintenance bill of any month within 15th of the same month. E.g. Bill of January 2015 must be cleared within 15th of January 2015. But this is not applicable for the defaulters exactly, they have to pay the bill along with the calculated penalty from day 1 for the whole period / month. Means, for defaulters the mentioned grade period of 15 days is not allowed. How can I backtrack my Maintenance Account details myself? The best way to do it is to go through all the concerned email alerts/bills regarding your maintenance payments which we regularly send every month. If you find any late-payment penalty in your account then to know the calculation better you can refer to following penalty calculation FAQ. If you can’t find the said emails, then please go through the following email related troubleshooting at your end. How much penalty will be charged if I become a defaulter? The amount of penalty depends on the time and amount to be paid for your case. To do the calculation, you can use the following example. It is showing a case of Maintenance bill & payment of three consecutive months, from January to March for an owner hypothetically. All calculations are rounded off to their nearest whole numbers. Note – as per the last EGM on 29-Nov-2015, this calculation has been changed and need to be done as per the above mentioned newly implemented due dates. Why can’t I find the FM / Info emails in my Mailbox? Check, whether you are subscribed to Owners’ Mailing List or not. If not then subscribe. Check, whether the said emails are going into Junk folder of your Mailbox or not. If yes then add the concerned Email IDs into your address-book and mark them as safe/priority senders. Check, whether the said emails are going into other folders/category like “Promotions” or not. If yes then follow the concerned FAQ below to solve it. Try Search-all-emails/folders feature of your mailbox from srijanmidlands.co.in, which will definitely show all the emails from FM / Info. How can I get the FM / Info emails into my desired folder / category? If the emails are not going into the Primary Tab/Folder of your Gmail Inbox then please try the following instructions to solve it. 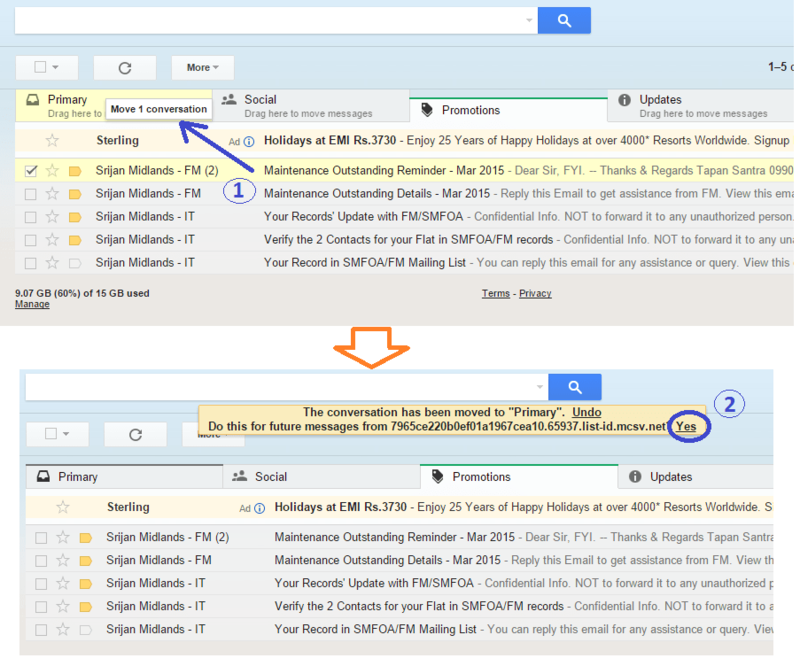 Please drag at least one email from FM or Info to the Primary tab/folder of your Gmail (Default view). This is a one time settings activity. Following figure shows the two simple steps required to achieve it. How should I report a problem to FM Team for better response? To prioritize your emails for any problem, you should write your email to FM containing any of the following words in Subject Line. These types of emails are maintained in an automated “Issue List” by FM Team. Can’t I get a hard copy (paper bill) of the E-bill from the FM team if required? Yes, on personal request you may get a hard-copy of the ebill. But that depends on the concerned team’s discretion. Why am I not getting the SMS alerts from FM / Info? Check, whether you are following Srijan Midlands on Twitter or not. If not then follow and turn on mobile notification in settings for the same. Check, whether you have configured your mobile settings in your Twitter account properly or not. If not then configure your desired mobile number and alerts in Twitter settings. More help on this. Why am I getting too many SMS alerts from Twitter? Check, whether you are following many (other than Srijan Midlands) on Twitter and turned on mobile notification in settings for all of them or not. If yes then Unfollow the unwanted people and turn off mobile notification as per your requirement. Check, whether you have configured your mobile settings in your Twitter account to receive notifications only for “Tweets from people you have enabled mobile notification” or not. If not then deactivate (uncheck) all the unwanted alerts in Twitter settings. More help on this. Where can I get SMFOA BODs’ Election related FAQs? How can I get access to the SM-Club WiFi? Email an application mentioning your device’s (Mobile or Tab only) MAC address and your Flat# and Block# to FM. Email from your registered Email ID (where you get FM alerts / emails) only. You can also write a hard-copy application to the FM instead of above said Email. On or before the above step, you have to be a member of SMFOA and a non-defaulter owner. You need to pay an onetime registration fee of Rs. 300/- per MAC address to SMFOA as a final step of the process. WiFi access will be enabled within 7 – 10 days after above said payment or final step. Will there be any monthly/yearly charges for the internet, accessed through SM-Club WiFi? No. Except the onetime registration charge, it’s completely free of cost. What is the speed of Internet over SM-Club WiFi? Speed is 1 – 2 Mbps. But it varies depending on the number of users accessing it, and other network parameters. What is the coverage of SM-Club WiFi? Within and around the club only. How can I use the Club PC? Club Manager will be there to help you in this regard, please involve him to use the Club PC. It can be used for internet browsing or internet related works only. It’s a restricted and public use PC – so please follow the guidelines of Club Manager and Standard Security Measures positively. It’s a free to use facility for non-defaulter owners only, you need not to pay anything for it. It can be used within our Library-Timing, and Age-Restriction is as per our Gym facility.